​Pan Pan Narkprasert, a.k.a. Pangina Heals, is a force of nature who manages to say some serious stuff without ever taking himself too seriously. Insects have long been a staple in the countryside of Thailand. Now, a top chef is creating a buzz in Bangkok by putting this eco-friendly protein on the menu. Rising rents and police crackdowns in Thailand’s capital are driving some of the city’s small, independent nightlife venues out of business. She may once have been known for her appearances on Bangkok's high-society party circuit, but these days Naphaporn "Lek" Bodiratnangkura is living up to her fabled family name by building on a century-old legacy. Sittipon “Oz” Chanarat has been a journalist, an emcee, a restaurateur, an MTV VJ, and a boxer. Now, he travels the world in pursuit of cobra snakeheads, giant Mekong catfish, and other river monsters. 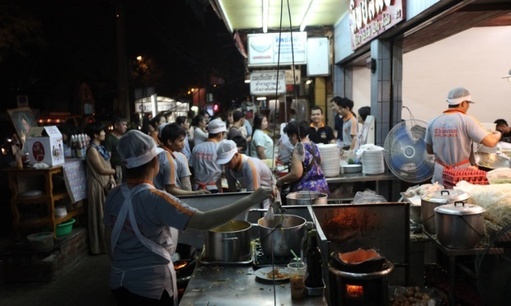 ​What’s Going to Happen to Bangkok’s Street Food Vendors? Facing a mounting crackdown, conflicting reports, and flip-flopping authorities, the city’s hawkers find themselves confronting an uncertain future.to edit. At Gaggan in Thailand, some of the emojis are informative, such as an eggplant, while others, including a tiny turbaned man’s face, are mystifying. At only 27, Pichaya “Pam” Utharntharm has worked under Jean-Georges Vongerichten and will serve as a judge on Thailand's 'Top Chef.' But she also helms one of the most sought-after dining destinations in Bangkok: her own dining room table. Skipping the temples and the backpacker hub of the Khao San Road, our writer focuses on the food, drink and arts scenes in the city’s vibrant neighbourhoods. It may look like Coachella, but Thailand’s Wonderfruit aims to be a less vacuous affair—and food is central here, with stalls selling everything from tom yam noodles to sashimi. While popular Thai destinations such as Koh Samui and Phuket stagger under the weight of development, these southern islands retain a sleepy, tropical charm. At the Bangkok restaurant 80/20, 80 percent of the ingredients are entirely local—including foraged herbs and vegetables so rare few Thais recognize them. 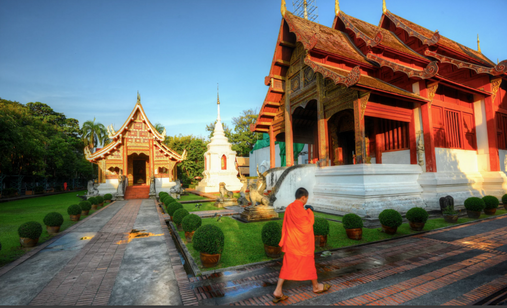 Long a laid-back center for creative types, Chiang Mai's art world is on the cusp of stardom. We stop by new galleries and chat with the artists reshaping this free-spirited enclave. Photographed by Cedric Arnold. It takes extraordinary measures to keep hops alive in Thailand’s hostile climate, but beer-loving brothers Teerapat and Nattachai Ungsriwong have managed to do just that. Ayu “Lee” Chuepa, a member of the Akha hill tribe native to parts of Southeast Asia, founded his coffee company six years ago, and thanks to a little help from Andy Ricker and Portland’s Stumptown, business is booming. It doesn't get much more surreal than these propaganda showcases, where photos are strictly prohibited and waitresses around allowed to leave the premises without a guard. Panida Paethanom, a.k.a. Chef Poupée, grew up in a family of cooks and worked in some of Bangkok's top kitchens, including L’Atelier de Joël Robuchon Bangkok. But she gave it up to start a food stall (now a restaurant) specializing in delicious burgers and sausages. Who better to decipher one of Asia's most dynamic cities than some of its most influential creatives? Renowned for their architectural, culinary and style expertise, Thailand's movers and shakers spill the beans on what's hot in Bangkok. ​Everyone loves Thai food. Here are some of the top spots for it—and so much more. Forget artisanal gin and craft cocktails – some of Bangkok’s bars are embracing yadong, a local, harder-core liquor. They’re getting harder to find, but there are still corners of rural and coastal Thailand relatively untouched by tourism. 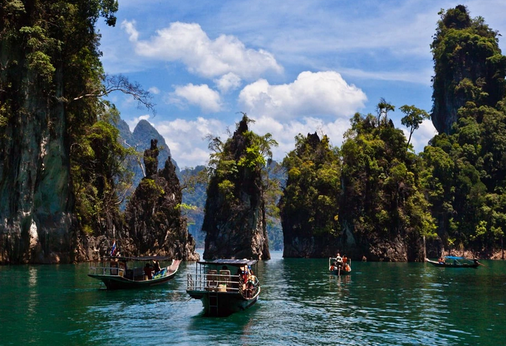 We pick unspoilt islands and stunning national parks away from the crowds. Forget sad, soggy tofu burgers. At these places, the meatless options are never dull. This ‘electronic playground’ also stocks more traditional board games and does a tasty sideline in gourmet burgers and craft beers. Considering how fantastic Thai cuisine can be, the country’s national dish is often a poor – not to mention bland and greasy – standard-bearer. But the pad thai at this busy Bangkok joint does the nation proud.